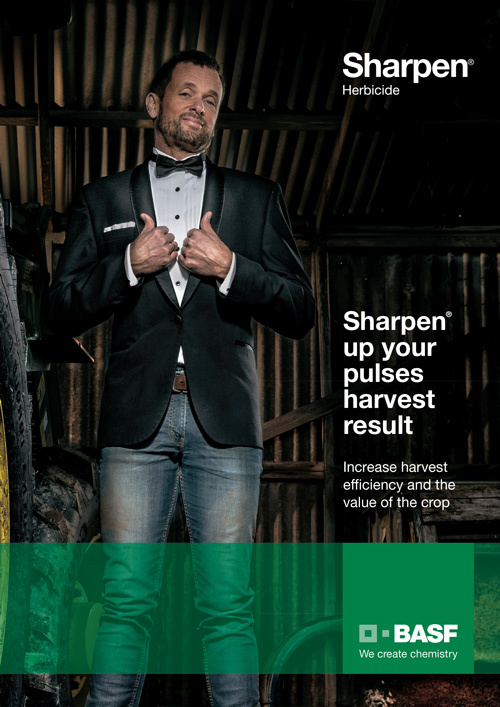 Sharpen® is the latest multi-purpose herbicide most growers will soon want to have in the shed all year round. It is rapidly gaining new registrations that reflect its exceptional reliability and versatility. Many broadacre farmers already value Sharpen for its robust control of problem weeds in fallow and pre-plant, and it is now registered as a harvest aid in winter pulses, for winter cleaning of lucerne and for wild radish seed-set control in winter cereals and established almond, citrus and pome orchards. In WeedSmart's crop-topping in winter cereals podcast edition, you can hear Phil Hoult, BASF Technical Services Manager, discuss Sharpen and it's unique fit for wild radish seed set reduction in winter cereals. Sharpen® is a fast-acting contact herbicide and helps control weeds through a process of membrane disruption. The foliar uptake of Sharpen is rapid and plant desiccation can occur within 4 days of application. Application should target small, actively growing weeds. Subsequent germinations will not be controlled. In most situations, Sharpen should be applied with a conventional boom sprayer with mechanical or bypass agitation in 80–250 L/ha water. Use higher water volumes if the weed infestation is dense or as weeds increase in size. Refer to label for further details. Fast broadleaf weed control prior to sowing certain grain crops and pastures, in fallow and in established lucerne crops. Rate: 17–34 g/ha + 1% v/v high quality MSO. Refer to label for recommended use rates for targeted weeds. Most broadleaf weeds can be controlled at 17–26 g/ha, but more hard-to-control and older weeds should be treated at 26–34 g/ha. Timing: Application should be made to small, actively growing weeds. Best control is achieved when weeds are exposed and are not shielded by other weeds and/or stubble. Problem broadleaf weeds that have germinated are easiest to control while in the small rosette growth stage. Refer to the label for ideal weed size targets. Sharpen's unique systemic activity reduces regrowth. The only Group G herbicide that provides standalone control of 32 broadleaf weeds, reducing the dependency on glyphosate. Tank-mixes with either glyphosate or paraquat control an additional 14 grass and broadleaf weeds. Suitable for spraying in drift-sensitive areas such as near broadleaf crops (e.g. cotton) because of its low volatility. Mixing Sharpen with glyphosate or paraquat helps to achieve higher levels of weed control and ultimately helps reduce the weed seed bank. Rate: 34 g/ha + 1% v/v Hasten or another high quality MSO. Timing:Apply from GS71 to GS83 and at least 14 days before harvest. Sharpen makes managing wild radish in the lead-up to harvest easier. Apply it early to protect cereal yields and set up next season. Using Sharpen to manage wild radish in the lead-up to harvest this season will help to reduce the weed burden in next year's crop. 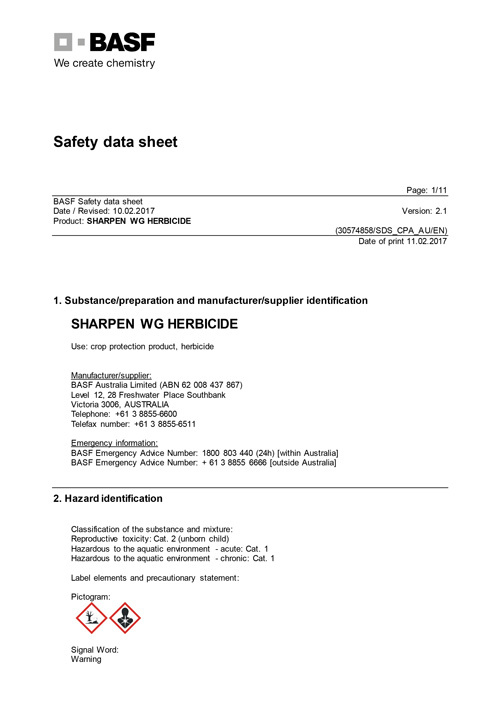 Sharpen is the only herbicide that can be applied in wheat, barley and triticale from the watery ripe crop growth stage (GS71) to reduce wild radish seed-set. Its high level of crop safety allows it to be applied in this very effective earlier application window prior to harvest than any of the other options for this use pattern. Timing: Apply once seeds reach full physiological maturity and at least 7 days before harvest. Rate: 17-34 g/ha plus 1% Hasten or high quality MSO. 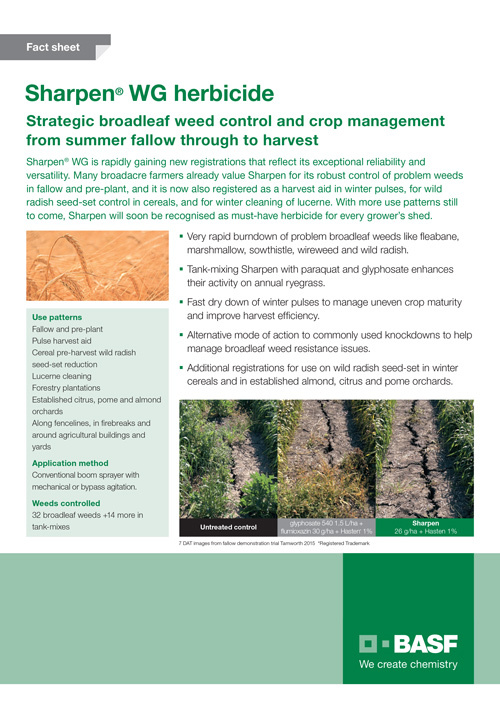 The registration of Sharpen Herbicide for broadleaf weed control in lucerne provides a much needed option for growers. It broadens BASF's product offer to lucerne producers with Spinnaker and Raptor herbicides already utilised for weed control across Australia. 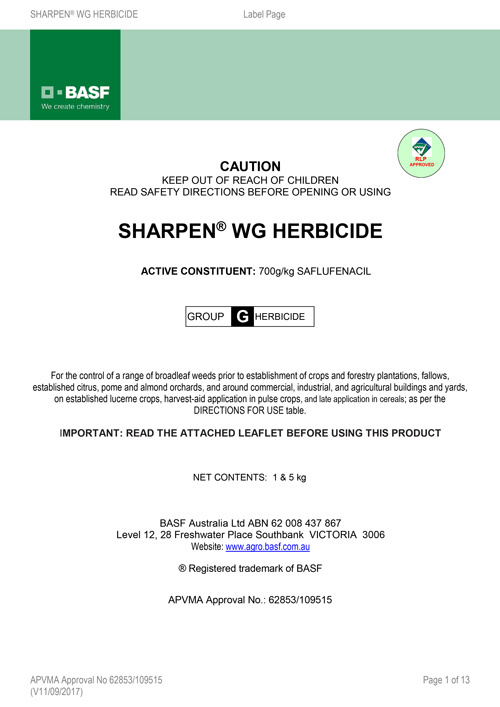 Sharpen can only be used in established lucerne, at least 12 months old. For optimal coverage and control, apply after grazing or hay cut. Sharpen can be used up to 1 hour before sowing sub clover based pastures for rapid and robust control. Tank-mixes with paraquat or glyphosate extend the control spectrum to 46 broadleaf and grass weeds.